The First World War. · One Book. One Author. One Hour. Notes on front and back endpapers include a list of government and military leaders at the beginning of WWI, statistical information on the size of the populations of Britain, France, Germany and Russia in 1910, their number of troops in 1911 and then in 1914, and a brief account of the events that lead to the outbreak of the war. Other notes refer to several WWI battles, e.g. the Battle of Tannenberg, the Battle of Verdun and the Battle of the Somme, the conditions of the Treaty of Versailles and its perception in Germany, the role United States played in the war, the German bombing raids against England in 1917, the British Blockade against Germany, and the British involvement in the Middle East and its promise of a homeland for Jews. -- Annotations by Brian Lamb in the margins and underlining of pertinent phrases throughout the book. -- Examples: p. 33: "The Austrians were fighting for the preservation of their historic multinational empire against disintegration provoked by their old adversary Russia. The Russians were fighting for the protection of their Slav kith and kin, for the defense of their national honor, and to fulfill their obligations to their ally France. The French were fighting in self-defense against totally unprovoked aggression by their traditional enemy. The British were fighting to uphold the law of nations and to pre-empt the greatest threat they had faced from the Continent since the days of Napoleon. The Germans were fighting on behalf of their one remaining ally, and to repel a Slavic threat from the east..."
Howard, Michael, “The First World War. ,” One Book. One Author. One Hour., accessed April 21, 2019, http://booknotes.gmu.edu/items/show/733. The European powers were ready for war in 1914. Germany, fuelled by 'archaic militarism, global ambitions, and neurotic insecurity', took the offensive, in the misguided belief that it would shorten the conflict. Four years later, eight million people had died in the most apocalyptic episode the world had known. 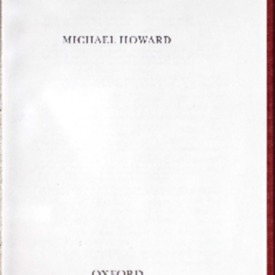 "Sir Michael Howard has meditated on the subject of the First World War for several decades. The result is an account of the events leading up to, and culminating in that conflict. With tremendous precision and clarity of vision he describes the effects of the conflict on soldiers and civilians alike, examining the military manoeuvres of the Allies and the rival alliances: the inhumane deployment of poison gas on the battlefield, the accelerated development of mechanized warfare, the establishment of the Royal Air Force in Britain, and the war at sea, which would draw America into the conflict. He highlights how the war fought at home - against the shortages of food, fuel, and raw materials for industry - caused the irreversible decline in German morale, a demise which was to lead to the eventual surrender of the German state." "Humiliated and bankrupt, utterly disempowered, Germany would never lose the belief that the war had been imposed upon her by the Allies. It would be that sense of injustice that would resonate through the decades to follow - to find final, chilling retribution in the hands of the Third Reich." --Book Jacket.